Downpatrick (from Irish: Dún Pádraig, meaning “Patrick’s stronghold”) is a medium-sized town about 33 km (21 mi) south of Belfast in County Down, Northern Ireland. Downpatrick is the largest town in the Lecale area, the historic barony that includes Strangford, Saul, Inch, Ardglass, Killough and Dundrum. It has been an important site since ancient times and its cathedral is said to be the burial place of Saint Patrick. On one of the low hills stands a giant statue of St Patrick, symbolically looking out from Lecale into the rest of Ireland. 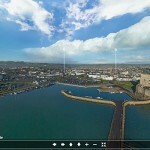 It commemorates the fact that this is the area where Ireland’s patron saint both began and ended his mission. 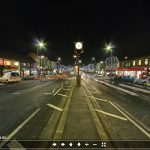 Today Downpatrick is a commercial, recreational and administrative centre for the locality and serves as a hub for the nearby towns and villages. Visitors to Downpatrick are able to access many of the cultural heritage sites, attractions and museums all within a short distance away. 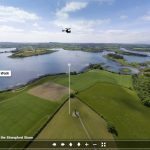 We flew our drone over the town and captured a couple of aerial 360° photographs. 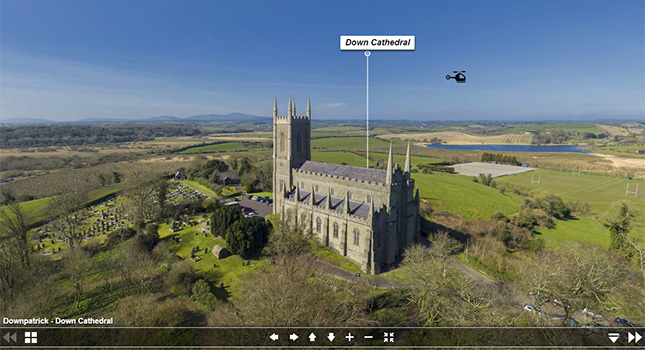 Look out for the marker points in the aerial virtual tours, some of which will allow you to jump from the sky down into some of the various visitor attractions found in Downpatrick. 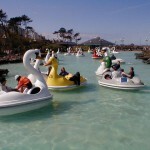 Travel back into the past on real vintage steam trains at Downpatrick & County Down Railway, take a stroll around Delamont Country Park on the beautiful Strangford Lough, amidst rolling countryside. Visit Down County Museum, located in the historic buildings of the 18th-century County Gaol of Down and one of the most complete surviving Georgian gaols in Ireland. The extensive remains of Inch Abbey are close by and for fans of the TV series Game of Thrones, Robb Stark’s camp was located here in season one and it was here that Catelyn Stark heard of Ned’s death, where Jaime was captured and Robb proclaimed King of the North. 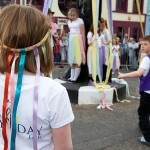 A great day out for young and old can be had in Downpatrick and County Down as a whole is a great place to stay and explore. Address: Downpatrick Visitor Information, The Saint Patrick Centre, 53a Market Street, Downpatrick, County Down BT30 6LZ.